Ovarian Psycos Present: OCTOBER LUNA RIDE – “This Bridge Called My Back” – THIS FRIDAY! – O.V.A.S. 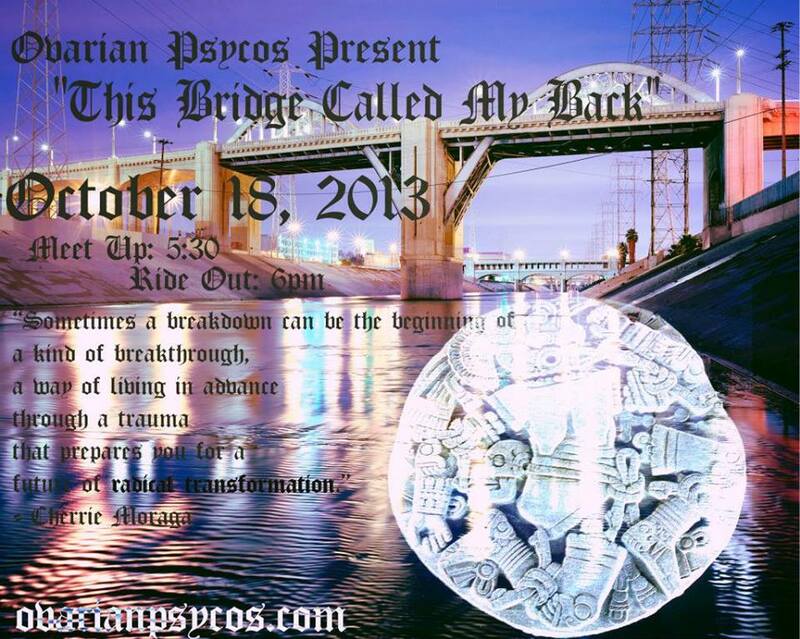 Ovarian Psycos Present: OCTOBER LUNA RIDE – “This Bridge Called My Back” – THIS FRIDAY! Join Las Ovarian Psycos this Friday October 18th as the Full Moon guides our path to healing. In honor of all womyn that have been victims of Breast Cancer & and Domestic Violence Los Ovarios del Barrio would like to dedicate this ride to all these beautiful & strong souls. We will be ending at the City Terrace Coyolxauhqui Stone where we’ll be engaging in a beautiful Full Moon Ceremony. Come with good spirit and an open heart and if you’d like bring some tobacco, flowers, or sage as an offering to Coyolxauhqui. Also, warm shout out to Corazon Del Pueblo! Check out their space and FB page. Help this autonomous space survive!!! Corazon Del Pueblo is a volunteer-run, not-for-profit collective, and community cultural center, that promotes peace, social justice and cultural understanding through the arts, education and social action. Nota: In efforts to creating a safe space where womyn can meet, talk, discuss issues, share experiences, and work on improving their lives and themselves FULL MOON rides are ONLY for WOMYN & LBTQ womyn who self-identify as lesbian, bisexual, transgender (including male-to-female and female-to-male), queer, in addition to wombyn questioning their sexual orientation and gender nonconformist. Yes, we believe and stand for diversity! Dearest Male allies & anyone offended by these efforts thank you for understanding and respecting the importance of creating and maintaining safe spaces. Previous PostPrevious “Ovarian Psyco Cycles’ Bike Brigade Is the Best Thing Ever” – according to JEZEBEL! Next PostNext Ovarian Psycos Present: The Tender Gender Bender Ride! This Sunday, November 24th!